The freezing, composting, and reed bed concepts listed in Table 1.4 are intended to prepare the sludge for final disposal or reuse. The freeze/thaw approach described in Chapter 9 can easily increase sludge solids content to 35% or higher almost immediately upon thawing. Composting provides for further stabilization of the sludge and a significant reduction in pathogen content as well as a reduction in moisture content. The major benefits of the reed bed approach are the possibility for multiple-year sludge applications and drying before removal is required. Solids concentrations acceptable for landfill disposal can be obtained readily. Land application of sludge is designed to utilize the nutrient content in the sludge in agricultural, forest, and reclamation projects. 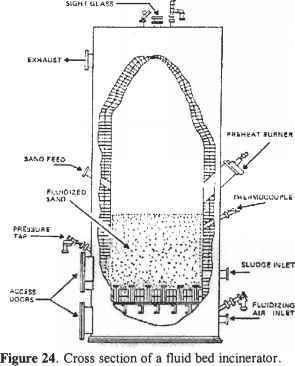 Typically, the unit sludge loading is designed on the basis of the nutrient requirements for the vegetation of concern. The metal content of the sludge may then limit both the unit loading and the design application period for a particular site.